American diners, cafes, bars and restaurants multiplied exponentially at the end of the Second World War, and many if not most of these publicised their existence by way of newspaper advertising, billboards and postcards. However, these were not the onloy means by which these establishments spread the word. The printed emphemera of drink coasters, matchbooks, and – in the case of cafes, diners and restaurants – menus, were also employed to bring in customers fresh from the war and eager for the service and convenience such places offerred. 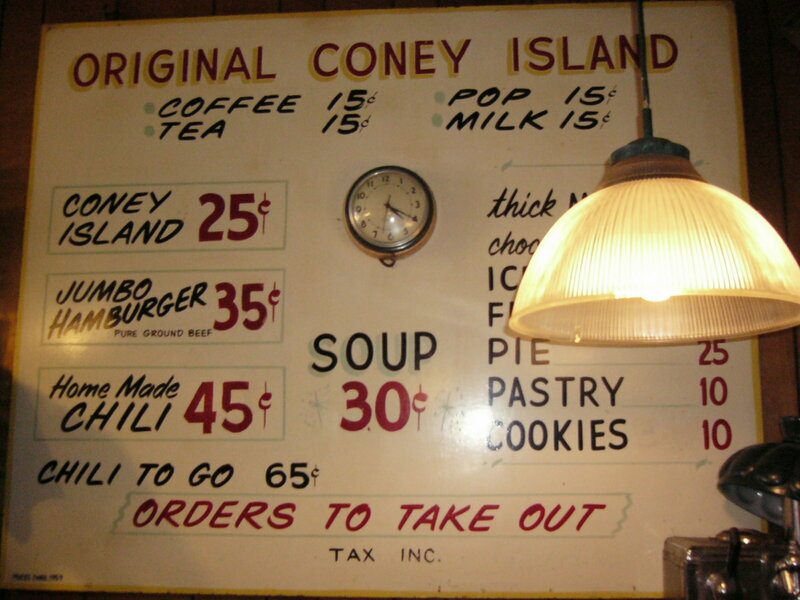 In most Mom and Pop joints, the menu was more often than not a home-made project, hand-typed and sporting any number of typos, and always (by the 1950s) with ever increasing prices invariably notated in ball-point pen, usually next to the crossed-out “original” prices. 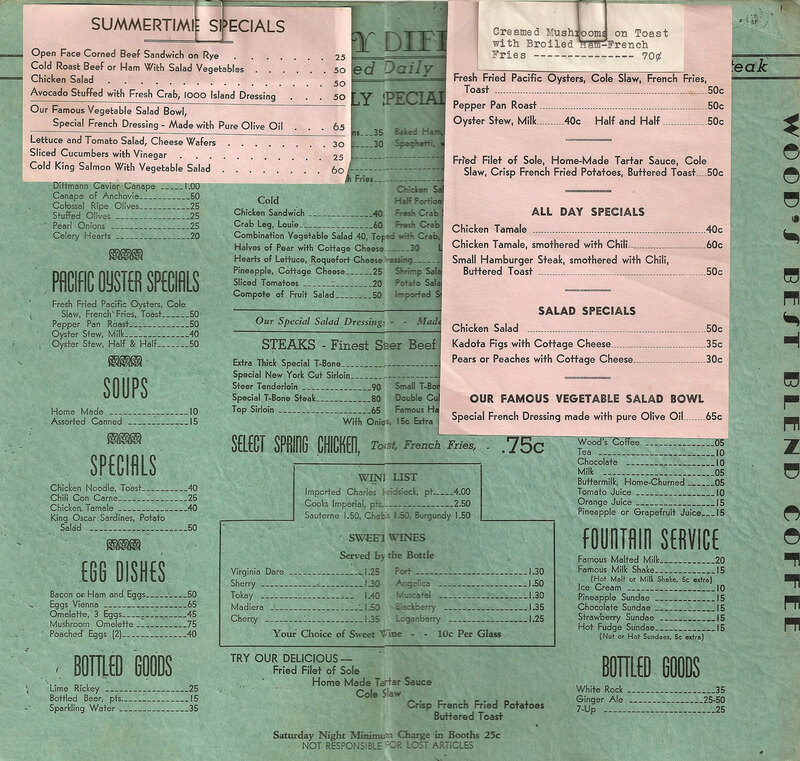 These handwritten menus would be inserted into clear plastic sleeves with some sort of heavy black border around the sides and presented to the customer, all limp and usually greasy from being handled almost continuously by other customers that had eaten their fried chicken and grabbed for the menu again to decide what they were having for dessert. Naturally enough, menus of this variety did very little to publicse the virtues of the eatery or to encourage their passing clientale to ever return. Larger, more established businesses realised rather quickly just how effective a well-presented menu could be in making a good impression, and made a point of creating attractive and often funny menus with interesting graphics and mouth-watering images of the food that was on offer. The best of these were frequently taken home by the restaurant’s patrons as souvenirs of their lunch or dinner. 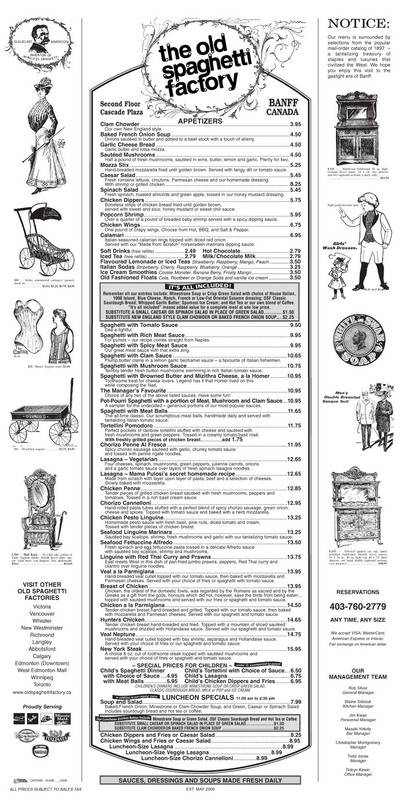 The Court of the Two Sisters in New Orleans had such a menu in the mid-1950s and even some of the chain restaurants from my childhood developed glossy and interesting menus that the customers would take away. I used to have one from Bob’s Big Boy Restaurant in Dallas when I was about 12. Another interesting feature of older menus, and one that frequently provokes mild astonishment in those that peruse them, are the prices. Did Mom and Dad really buy a beefsteak dinner for 49 cents? Such such were the joys! We forget that in those days a dollar-twenty-five an hour was considered a decent wage. As for matchbooks, well, I was never very keen on matchbooks. 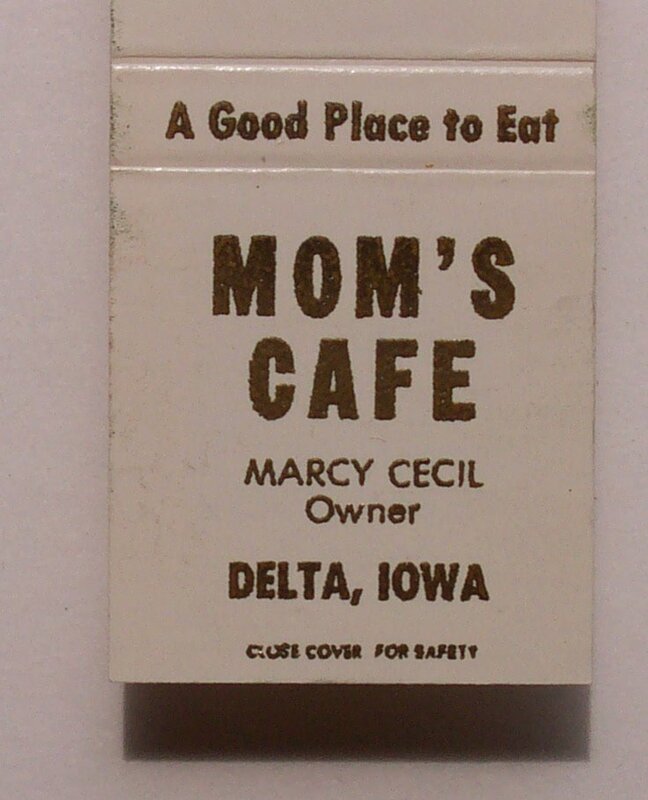 But after World War II, it seemed that every diner, gas station, motel, hotel and roadside attraction had its own, branded matchbook. My sister used to collect them when she was a teenager. She had hundreds of them from all over the United States. Alas, the matchbook is all but extinct now. Gone are the days when the health-giving stimulation of a great smoke was something even doctors advertised on radio and TV. Such such were the joys! Here are some of the images, enough to jog some of your own memories maybe, recalling those times before the interstates and those interminally long hauls between AAA-approved motels with vacancy signs, travelling cross country. It was a fairly regular feature of my upbringing, watching all of America pass by from the backseat of an Oldsmobile. I daresay of many of my readers, both in the States and elsewhere, will find something familiar here. Nelson Algren advised every young man that there were only three things he needed to remember in order to succeed in life, or, if not succeed, at least not fall too far into the pit of some self-made oblivion. His three rules? 1) Never eat at a place called “Mom’s”; 2) Never play cards with a guy named “Dad”; and 3) Never, ever, go to bed with anyone who has moe problems than you do. Wonder how the folks in Delta, Iowa, managed. 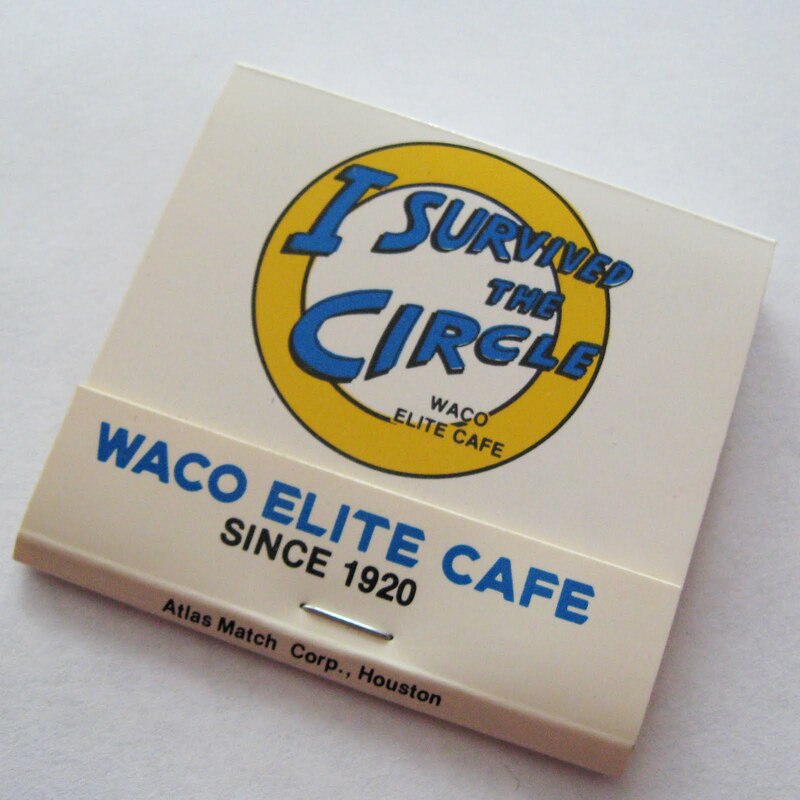 The Elite Cafe as it was known when I first ate there (in 1955) was located on “The Circle” – and it still is – a huge roundabout that in those days seemed to eternally confound most of the local drivers and visitors to the Heart O’ Texas. There were stories about people that would enter the Circle and go dizzy, going round and round for hours, dithering as to which turn-off was the one they wanted. My mother used to complain about it too, never sure who had the right-of-way and not trusting the other drivers to give way. The Elite was on The Circle, and right next to the motel we stayed in after driving out to Texas from California for my father’s work. Every morning, the chef would make a peanut butter sandwich for my school lunch. The place is still there. If you ever find yourself in Waco – and there are few that do – check it out. 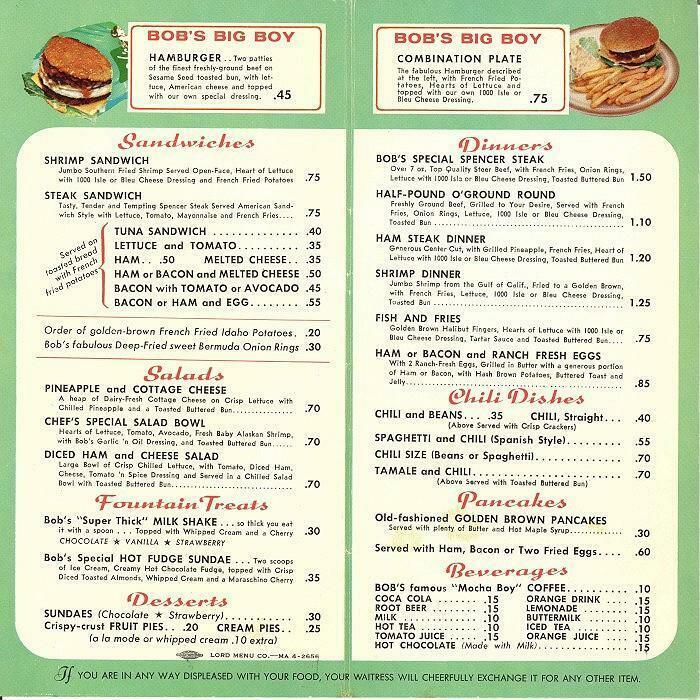 (Above) This is the inside of the legendary Bob’s Big Boy menu. I absconded with one that looked just like this when I was about 11 or 12. Can’t remember what I had for lunch that day – probably a Big Boy hamburger and chocolate milk shake. Toddle House was a chain of restaurants that one found predominantly in the mid-west and eastern United States. 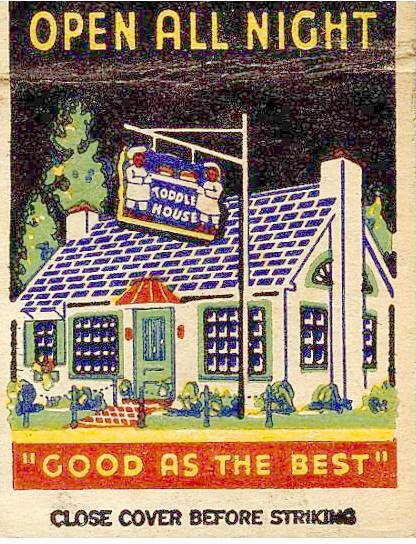 The picture on the matchbook show you what every Toddle House restaurant looked like. Good as the Best was its claim to fame, and that was good enough for most of the travelers that found in its homey exterior a familiar and inviting icon. (Above) The Old Spaghetti Factory was a favorite of mine the two summers spent in Banff, B.C. Again, this was a popular chain of restaurants that produced a quite attractive and appealing menu that many of its customers wanted to keep. Additions and corrections were the order of the day for many greasy spoons. 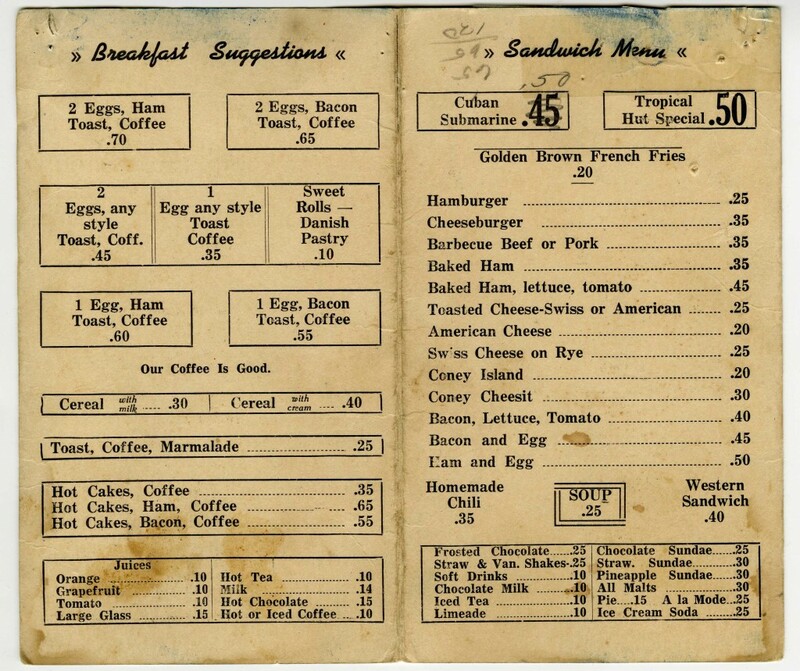 Standing in marked contrast to the bills of fare of the big, flashy chain eateries, these menu cards were often soiled, dog-earred and thoroughly unappetizing to hold, though for some reason – even as a kid – I found them fascinating. 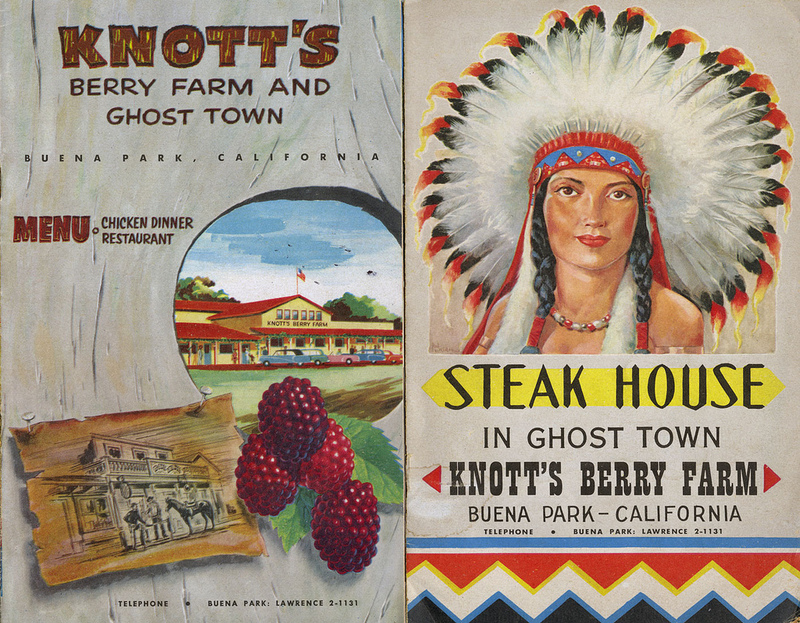 Knott’s Berry Farm was famous for many things, not the least of which wwere its biscuits and boysenberry conserves. They also produced a souvenir menu, adhering the their well-branded western theme. 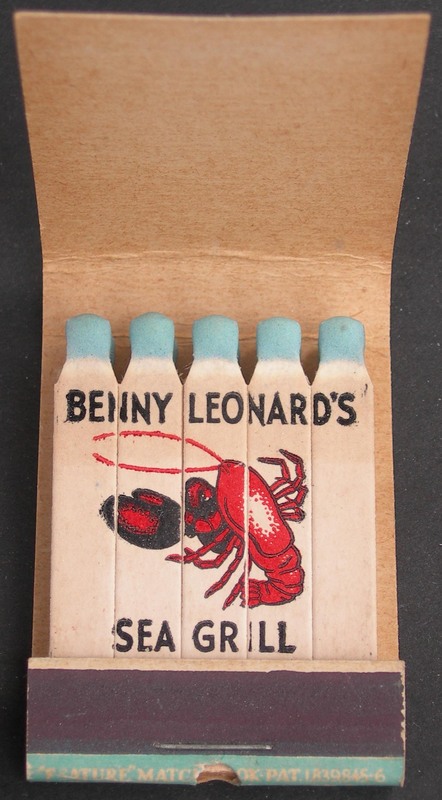 The artwork often extended to the interiors of the matchbooks. Benny Leonard – who had retired from the ring – made sure his name was covering just about everything. The name and the image appeared on every match and when all the matches were gone, one discovered that the message and image were printed on the inside cover as well. Gallery | This entry was posted in Memories, Miscellaneous. Bookmark the permalink. Sorry for that. Have made the attribution, with thanks! thank you my friend. I will also put this in my blogroll! Sir, I appreciate 100% your work on the vintage menus, they are great! One small correction, Bob’s Big Boy Restaurants were NOT in Dallas, Texas. Mr. Fred Bell and wife purchased a Big Boy franchise from Mr. Bob Wian (Big Boy founder) in CA and called his restaurants Kip’s Big Boy Family restaurants with the first location opened on the corner of Lemmon and Inwood in Dallas in the late 50’s. Kip’s Big Boy restaurants in OK and KS were owned and operated by Mr. Thomas Holman Sr. and James D. “Bucky” Reed. They (Kip’s Big Boy in OK,KS) were also franchises from Bob’s in CA and the first Kip’s Big Boy was opened in 1960 on N. May Ave. in Okla. City, OK. Mr. Holman had worked with Bob Wian for over 20 years and awarded the franchise for OK/KS. Thank You. Mark Gelhaar 608 N. 7th St. Lumberton, MS 39455 retired Kip’s Big Boy former Mgr. Okla.
thank you for your correction. yes, it was Kip’s but I also remember it had the same Big Boy statue standing outside. Would these two different franchises have shared the same trademark? Yes! stonekingseminars the two separate franchises Kip’s in Oklahoma and Kip’ in Texas used the same name (Kip’s) for people to identify the original Big Boy Hamburger in the central and southwest portions of the country. Fred Bell was the franchise owner of Kip’s Big Boy Restaurants of Texas, and Mr. Tom W. Holman and James “Bucky” Reed were the owners and operators of the Kip’s of Oklahoma Inc. Big Boy Restaurants until all Kip’s Big Boy Locations in TX and OK were acquired by Frisch’s Big Boy Inc. Cinn. OH in 1972. Whichita, KS locations of Big Boy locations were called Kip’s Big Boy and owned by Mr. Holman and Bucky Reed also sold to Frisch’s. You are correct on “The Toddle House ” as the snack bar only small restaurant open 24/7 all over the US and joined “Dobbs House” restaurants in the mid 60’s were owned by the Beechnut Corp. and later Squibb Drug Co. Toddle Houses and the Dobbs House Restaurants are now all closed. There are many of the “recognizable buildings” still existing and being used as small business operations (except food service) and they are all privately owned. Many states had numerous locations in many cities and they give us “old schoolers” many fine enjoyable memories of times past, Humpty Dumpty Eggs, Brock Sausage, Cream Waffles, and Chase and Sanborn Coffee!